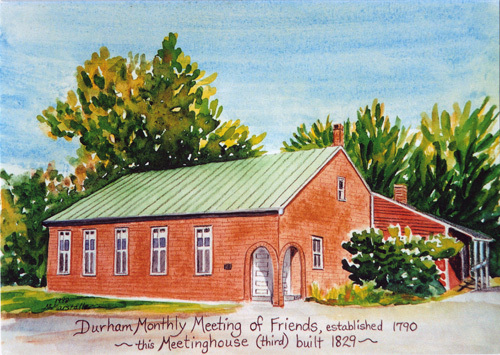 Durham Monthly Meeting of Friends is a community discerning and serving the will of God. Our understanding of God comes through corporate worship, study of the Bible and other literature, a sense of God through Jesus Christ, through continuing revelation, and in confirming experiences, many of which we share with one another. The Meeting should provide opportunities for the individual to grow in faith and in expressing that faith. For these purposes it is important for us to attend Meeting for Worship and Monthly Meeting for Business, to support the Meeting financially, to serve on committees as time and energy allow, and to take part in opportunities provided by the Meeting for worship, study, and fellowship with others. The Meeting is ideally a supportive community for those in it. It cannot be exclusive, but must make its resources and programs open to all. Friends World Committee for Consultation.